It is not just diamonds and gold that commands an expensive price in the luxury world as technology comes a close second! 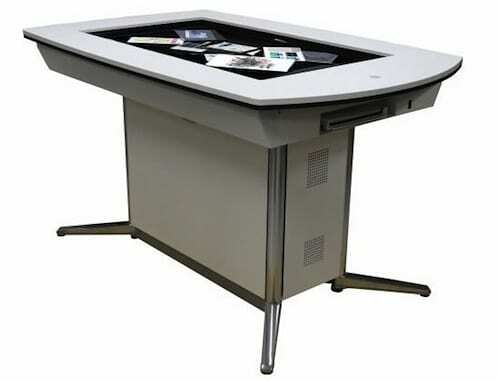 Japanese tech giants, Pioneer recently unveiled the Discussion Table which is suitable for design conscious workaholics. The WWS-DT101 Discussion Table is actually an interactive work desk that draws it juice from a Core i7 processor and 6GB of RAM. Running on Windows 7 OS and a proprietary UI called SCHEDA, the table can be paired with laptops, tablets, smart-phones and cameras wirelessly. However the highlight is no doubt the 52-inch, 1920 × 1080, multitouch glass top which takes the term desk job to a whole new level. Pioneer hasn’t announced a price yet, but don’t expect it to be cheap.